Roly Smith visits the set of the gritty BBC One drama series The Village, filmed on the western edge of the Peak District. Watched over by the elegant, pinnacled tower of the Georgian church, villagers gather solemnly around the war memorial. There’s an air of foreboding as, mingled with the long dresses and coats, bowler hats and dark suits, are the crisply ironed khaki uniforms worn by the young men of the village. It’s 1914, and the village is bidding farewell to its virgin soldiers, many of whom will not return from the horrors of the Somme and the senseless slaughter that became the hallmark of the First World War. 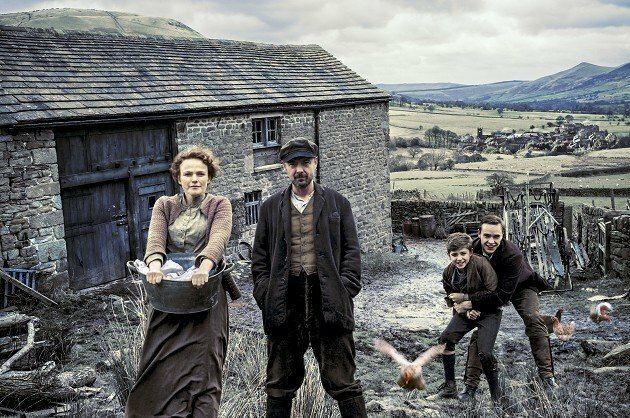 It’s the opening sequence in the new blockbuster BBC One drama series The Village, which was shot in and around Hayfield, Derbyshire, and other towns and villages on the north-western side of the Peak District. But unlike most recent period dramas such as Downton Abbey or Pride and Prejudice, this series, written by BAFTA-winning writer Peter Moffat, looks at world events through the lives of ordinary people. Among the star-studded cast of more than 40 established and many up-and-coming actors is John Simm (who starred in The Lakes and Life on Mars) as troubled farmer John Middleton, and Maxine Peake (Shameless and Silk) as his long-suffering wife, Grace. But why choose to set the drama in this High Peak village? As we walked to the Royal Hotel in Hayfield crossing the River Sett by the village bridge, Emma described how the night before, John Simm had plunged, unscripted, thigh-deep into the icy-cold river as his character John Middleton desperately searched for his missing son, Bert (played by Bill Jones). “My character is a matriarchal figure, I suppose, trying to hold the family together. But she also represents the way that women have been treated through the centuries, and ends up, as so many did during the war, working in the local factory. Women were finding independence for the first time, moving into the workplace as the men went off to fight. Maxine was often taken to the Peak District by her parents as a child, so knows the area well. For Juliet Stevenson (Lady Clem Allingham), perhaps best known for her role in Truly, Madly, Deeply and her work with the Royal Shakespeare Company, filming in Derbyshire is like coming home, because her partner, anthropologist Hugh Brody, comes from Sheffield. Hayfield was transformed into the eponymous and anonymous village for the duration of filming for the series. Kinder Road was converted to High Street, with suitably distressed painted shop fronts advertising the village greengrocer, drapers and hardware store. Rosie’s Café became Hankin’s Drapery Shop, but the filming didn’t stop Andrew and Deidre Stables, the proprietors, from serving their customers (and the production crew) with Deidre’s home-baked cakes and fresh sandwiches. Below the ‘High Street’, the surface of the steep incline of Dungeon Brow was torn-up and converted into a dirt track. As was the cobbled alleyway that leads down to The Royal Hotel, past the wooden porch of the fictional Lamb Inn in The Village. The actual pub interiors seen in the series were shot in the King’s Arms Hotel in nearby Chapel-en-le-Frith, where the town’s Institute was also converted to The Playhouse. The local big house, home of the ruling Allingham family, is the Victorian Gothic pile of nearby Bowden Hall, and the estate’s farm and kitchen gardens are those of the National Trust’s historic estate at Tatton Park Farm, near Knutsford. Local building contractor Nigel Webb lives at the nine-bedroomed Bowden Hall, which has origins dating back to the 14th century. John and Grace Middleton’s poverty-stricken farm is Highfield Farm at Upper Booth, Edale, on the southern side of Kinder Scout, and the village train station, where the soldiers leave for the war, is a remodelled Edale station, on the Hope Valley Line. As you watch the series unfold, these disparate parts of the Peak landscape will be seamlessly fitted together to tell a compelling story of our rural past. Tags: actor, bbc one, bbc1, chapel-en-le-frith, derbyshire, Drama, dungeon bow, edale, filming, filming locations, hayfield, highland farm, hope valley line, john, kinder scout, kings arms hotel, knutsford, location, maxine peake, peak district, peter moffat, simm, Television, the village, tv. Bookmark the permalink.